I don’t mind being an otaku, but I DO mind being a laggard otaku sometimes. I don’t know why I’ve never watched this anime. I’ve heard so many people talk about it, and just stuck to my same bread-and-butter animes: Samurai Champloo, Yu Yu Hakusho, and Cowboy Bebop. One reason I stayed away from Death Note was because it seemed a bit dark for me. I admit that Cowboy Bebop is a darker, more serious anime, too, but Death Note is on a different level. With a name like Death Note, I’m sure you get the idea. 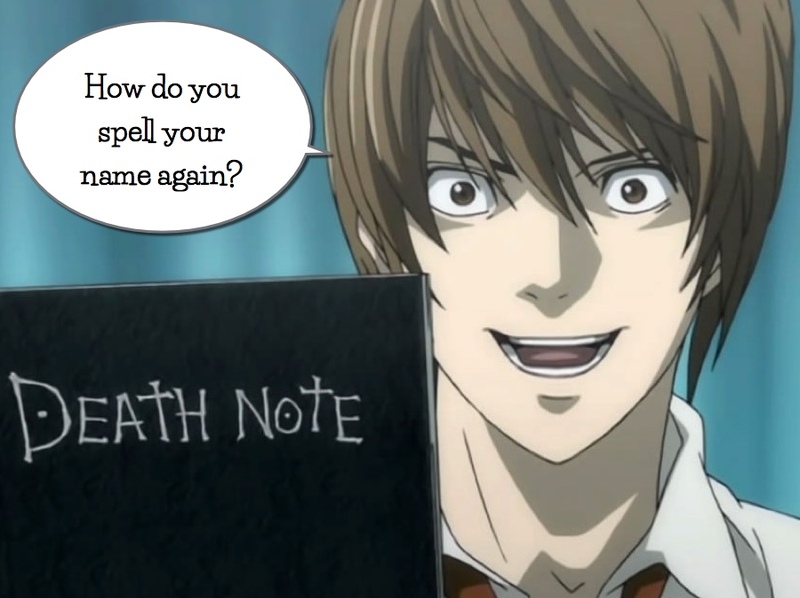 1.The person’s name you write in the Death Note will die (with the exception of the Death God. I guess that makes sense). 2.You have to have the image of the person in your mind, when writing their name; this prevents people with the same names from being killed. 3. If the cause of death is written within 40 seconds of writing the aforementioned person’s name, it will happen. 4. If no method is specified, the person will die of a heart attack. 5. If you write down the name and cause, you have 6 minutes and 40 seconds to write the details of the person’s death. I won’t go into all of the details of the first episode because I don’t want to spoil it for those who haven’t seen it. But it’s pretty intense, to say the least. If some death god dropped a notebook that gave you the power over life and death, and you were the first person to come across it, what would you do? Would you pick it up? Would you leave it there? If you picked it up, would you actually use it? Well, honestly, I DO think my curiosity would get the better of me, so I would pick it up. Even if it was just to keep it from falling into the wrong hands. I would probably try using it once on someone extremely dangerous or someone who indiscriminately killed lots of people. For example, there was Mamoru Takuma, who went into an elementary school and murdered 8 children between the ages of six and eight. He injured 15 others (which included both students and teacher) at Ikeda Elementary School in Osaka…true story. In that case, I wouldn’t feel bad writing the name (he was later sentenced to death), and it would be a way to test if the book really works. If it actually worked, I might burn the book, because having that kind of power is incredibly dangerous and incredibly final. Humans can be emotionally-driven creatures. What if you had a bad day, and just decided to start writing names in the Death Note just because? The clerk at McDonald’s that got your order wrong, that teacher you don’t like, that man that screwed you out of whole lot of money, that girlfriend or boyfriend treated you like crap. I have had my fair share of bad experiences, but wishing death on somebody…that’s heavy. Wouldn’t a simple a** whoopin’ be better? Let’s get to the nitty gritty question. If you found a Death Note, in real-life, what would you do with it? If you would use the Death Note, please be specific and say how and why. If you wouldn’t use the Death Note please be specific as to why not. Cool? I hope to hear from you in the comments section below.